We recentl y received an email regarding the 2014 Vitamix Labor Day sale. The sale is similar to a previous deal where the Vitamix Standard Reconditioned Blender was only $299 plus free shipping when using promo code ’06-009709′. When you use any of our links, we automatically include the code to make it simple for you. The Vitamix Standard Reconditioned Blender is not only a great Labor Day deal, but is a blender that is capable of creating amazing smoothies, soups, and dips. We recommend this blender over the Vitamix S30 because it is cheaper and provides the ability to make soups and dips. Vitamix Blender Labor Day Sale: Save $30 off the Vitamix Standard Reconditioned Blender plus free shipping. This lowers the price from $329 to $299. Below is the product information that can be found on Vitamix.com along with a link in case you are interested in learning more about this great deal. If you have any questions regarding this machine, please contact us! The Vitamix Standard Reconditioned Blender is one of the top 3 selling blenders on Amazon.com. The top 3 selling blenders on Amazon.com include Vitamix, Nutribullet, and Ninja Professional blenders. 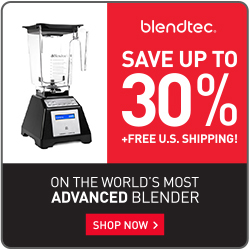 If you have any other Vitamix blender deals, let us know so we can share with our readers!